Accolades For the Clean-Up Crew! What hangs around harbors and fields, clad crisply in white, cleaning up the flotsam and jetsam of the neighborhood? What laughs and frolics in the midst of a hard day’s work? What sparkles against the winter sky and settles like a cool breeze on a summer’s beach? Perhaps you’ve guessed it – sea gulls. I propose we give a bit more respect to those sometimes pesky, always rowdy, hardworking, independent, strong-willed, helpful birds. Sure, they leave droppings on our sidewalks and car windows, and sometimes even on our hats. But they also clear the beaches of the dead fish and garbage, eat insect and vermin that harm crops, and entertain children at the seashore with their sassy antics. They glide and swoop and ply the air currents with assurance and abandon. Black-backed gulls – Big guys with handsome white bodies, black wings tipped in white and snappy, polka-dot tails (when they’re not in breeding.) They have the deep, harsh, slow call. Bonaparte’s gulls – You guessed it, loners with small, black bills and short, reddish legs. 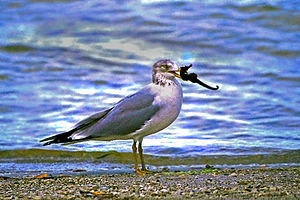 Adept flyers who often pick their food right off the water’s surface. Herring gulls – Large, brown birds that enjoy a crowd and hang out with his buddies in all the right garbage bins. They prefer fish for dinner, but long ago adapted to sharing their habitat with messy, pesky humans. Kittiwakes – Small, with black bill and short black legs, rather clumsy, kamikaze-style divers that prefer to winter at sea with their mates. Like the Laughing gull, the Kittiwake takes its name from its distinctive warble. 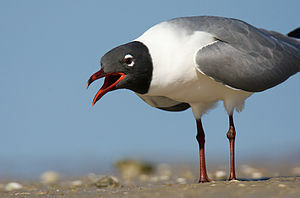 Laughing gulls – Big, raucous beggars, easily recognized by their call, a demanding guffaw. These are the flocks who take over parking lots and picnic areas where food is plentiful. Ring-billed gulls – These guys are the ones you see following the farmer’s tractor, lunching on crickets, locust and other pests that could destroy the farmer’s crop. Second – Gulls have fairly large, muscular bodies, but they adeptly traverse the air currents on land or at sea. Gulls guard their resources, flying no higher and no faster than is necessary to travel great distances or skim the water’s surface while fishing. Gulls fly between 15 and 28 mph on wings spanning from 20 inches to well over five feet. No surprise that their powerful wings have been models for sail makers since ancient times. Third – Gulls are serially monogamous and great parents. Caring for the eggs and chicks are full-time jobs for both male and female gulls. They share the house/nest work, incubating their two or three eggs until they hatch. Both Pop and Mom feed and supervise the hatchlings for nine or ten weeks, until the fledglings are ready to take wing. The team work of gull couples pays off; the survival rate for gull chicks is exceptionally high, over 80%. They know the value of family and community! Fourth – Being responsible parents and couples seems to pay off in longevity too. Gulls live to be 20 and even 30 or 35 years old – amazing in the avian kingdom. Finally – Gulls have adapted to the ever-increasing human population. They’re smart and flexible, able to change with the circumstances. Their noisy calls are actually a fairly complex vocabulary. Researchers have found that gulls recognize individual human faces, even after extended periods of time, though I’m not sure why they bother, since we don’t’ seem to share any particular affinity with gulls. Earlier I mentioned the gulls cousins, terns and skimmers. You probably won’t see terns until the spring, unless you join them in the southern migration. But I thought I’d take a moment to clear up one point that may have piqued your curiosity: How do you tell a tern from its cousin the gull? Well, in the air, gulls fly with their heads extended forward while keeping their eyes on the water. Terns bend their necks and heads down toward the water as they fly. 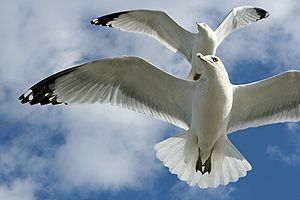 On land or floating in the water, you’d probably describe the gulls as husky, muscular fellas with sturdy, short bills. The terns are small and slender, with black eye-masks and longer bills. As for the skimmer, you may see a few along the seashore over the winter. You’ll have no trouble recognizing them by their prominent, orange beaks. Their low, strong bodies and wings allow them to skim the surf dragging their lower bills in the water, capturing small fish as they go. They travel in flocks and perform close-formation acrobatic flying as they ply the surf along the seashore. So, may I suggest that you take a few minutes to admire the ubiquitous gulls that will surely be wandering around the beaches, foraging in the frozen fields and gardens, and cleaning up the carrion along the roadside too. 5 Responses to Accolades For the Clean-Up Crew! What a wonderful tribute to our fine feathered friends. I was aware of the large variety of gulls, Skimmers being my favorite , but you always amaze me with honorable details…monogamous gulls! It softens an otherwise questionable view of these prolific birds. How wonderfully interesting! There is a boat on the mooring over named ‘Kittiwake’ & now I know it’s meaning! Thanks Janice & very best to your family! Your words have given me new respect for those wonderful flying machines. Again, you open our eyes to the mysteries of nature. They are so ubiquitous — I was glad to take a few moments and learn more about them. The different birds we saw while staying in Florida last fall enhanced our trip so much — many of them gulls, skimmers and terns! I do miss hearing them when we are inside during the winter. I sure would like to know – when I’m sitting on the beach, surrounded by very noisy gulls – would love to know what they’re saying – like last year you brought us bread, so where is it?